As Philadelphia Eagles quarterback Michael Vick was being driven home by his wife Sunday after suffering a concussion against the Dallas Cowboys, there were plenty of people theorizing that Vick was done for the season, regardless of how quickly he might pass medical evaluations. Some of that speculation was whether coach Andy Reid might use the occasion to his benefit. Two sources said Monday morning that it's a pretty strong bet that, barring an odd change in circumstances, Vick will be "rested" for the remainder of the season by Reid and the coaching staff. In place of Vick, rookie Nick Foles will start, and the sources believe Reid will use the development of Foles as a springboard to keep his job as the Eagles' coach. "I'm 99 percent sure that's exactly what you're going to see happen," a source said Monday morning. "Andy is going to go to [owner] Jeff [Lurie] and [general manager] Howie [Roseman] and say, 'Let's go with Foles and make the transition to the next era.' "
Vick's possible benching had been speculated for weeks, but Reid strongly endorsed sticking with his starter prior to the Nov. 5 game against the New Orleans Saints. A second source believes Reid stuck with Vick because the coach feared he would lose the faith of his players if he made the switch. The Pittsburgh Steelers entered their much-anticipated grudge match with the New York Giants ranked in the bottom half of the NFL in rushing. Injuries to Rashard Mendenhall and Jonathan Dwyer made the road trip even more of a challenge. Thanks to Isaac Redman, the Steelers made themselves feel right at home. The third-string running back rushed for a career-best 147 yards and scored the winning touchdown in Pittsburgh's 24-20 victory at MetLife Stadium in Week 9. Redman, who went undrafted out of Division II Bowie State, did the heavy lifting with 26 carries despite sitting out the previous two games with an ankle injury. Behind Redman, the Steelers dominated time of possession (35:15 to 24:45) and wore down the Giants' defense, which watched helplessly as Pittsburgh scored 14 unanswered points in the fourth quarter. Redman's 28-yard burst before the two-minute warning allowed the Steelers to run out the clock. Now, Reid has a far more reasonable excuse for making a switch to Foles, who completed 22 of 32 passes for 219 yards, one touchdown, an interception and a lost fumble in Sunday's 38-23 loss to the Cowboys. Like Vick, Foles was harassed constantly by the Cowboys' pass rush because of Philadelphia's inept and injury-plagued offensive line. 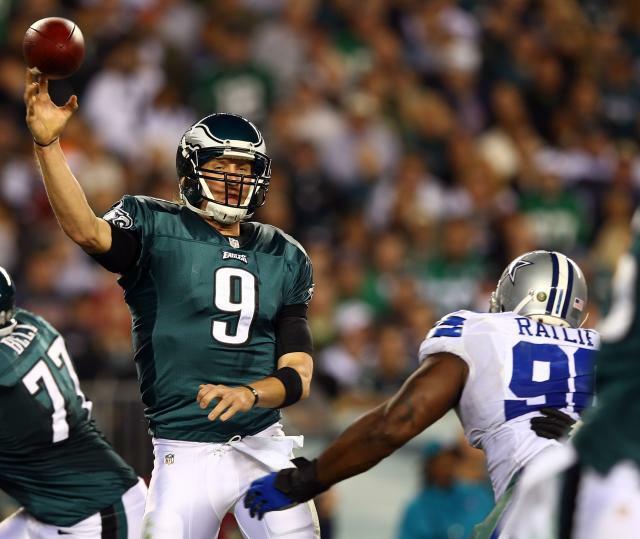 Both Foles' interception and fumble were returned for scores by the Cowboys. However, Foles also did enough to make people around the Eagles believe that he still has significant upside as a long-term starter. The 6-foot-6, 243-pound Foles was drafted in the third round this year, taken 13 slots after current Seattle Seahawks starter Russell Wilson. Foles also performed effectively in the exhibition season. "He has a feel for where everything was coming from, and he was athletic enough to get away from the rush a lot of the time," an Eagles source said. "He hurried a few things, but he didn't look flustered. You could see that he knew right away what the mistakes were and had an idea about how to fix them." Beyond that, Foles' size may allow the Eagles to run a more traditional pocket offense because he can see over the line better than Vick, who is listed at 6-feet tall. "You can run all the timing routes and throws to spots that you want, but it helps when the quarterback can see it for himself," the Eagles source said. "We have always had the issue with [Vick] about seeing the play and trusting it. It's just something you have to deal with as a player and as a coaching staff. With Foles, maybe that gets easier." As for Vick, the situation could ultimately signal his final days with the Eagles unless Reid is fired and replaced by someone next season who wants to stick with the veteran passer.